Here's my version of the basic tee I drafted while participating in the draft-along at Sew Country Chick. Drafting your own patterns isn't as difficult and time consuming as I had originally thought. It does require some trial and error but I'm happy with the outcome. I made a muslin with some cheap knit. For the most part, the body of the tee fit great but the sleeves were almost too narrow for me to squeeze my arms into (can we say wearing ease, anybody?). I also ran into the same problem as Justine did with some extra fabric bunching and sleeve cap issues. She warned us- but I guess I have to figure it out on my own sometimes! So I scooped out the armhole on the front and back body of the tee to create some negative ease- worked like a charm! For my finished project, I used an ITY jersey print that has been hanging out in my stash for a while. It's the perfect weight for this tee. I really like the geometric print. Although I added width to my sleeves, they are still a bit narrow for my preference. So next time around, I will add a bit more. Otherwise, I'm very happy with my basic tee pattern and can see myself making several of these in the future. 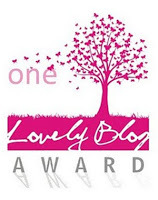 In other news, I owe a special thanks to Adrienne for her nomination for the "One Lovely Blog Award". It's always nice to be appreciated by other bloggers and helps motivate me to keep my little blog going! Check out her blog Stitching on the Edge for all sorts of cute projects! This tee looks super (colours are lovely on you) - drafting your own patterns must be rewarding if this is the result!